An Inquest is held when someone has died in certain specific circumstances. Inquests are only held when an investigation is necessary to establish the facts about what the cause of death was, usually when the person died suddenly or in circumstances that remain unexplained. For example, deaths that have occurred as a result of violence, due to unnatural means or as a result of sudden and unknown causes would all necessitate an Inquest taking place. Will there be a jury present at the Inquest? In most cases, no. It will be the coroner who, having heard all the evidence, will make a decision on the conclusions that they have reached. Any member of the public may attend an Inquest which is held in a courtroom. An Inquest is held in what is known as ‘open’ court, so in addition to members of the public, the media can attend too. Do certain people have to attend an Inquest? I have heard the term ‘properly interested person.’ What does that mean? A coroner will usually ask members of the deceased’s family to appoint one member of the family to be a main point of contact when it comes to notifying them about when the body is to be released following a post mortem, key outcomes of the post mortem, the date, time and venue of the Inquest, to see written evidence that will be adduced at the Inquest and to have the opportunity to object to any evidence being adduced. That main point of contact will also have the opportunity to question witnesses at the hearing. I am the nominated person of interest on behalf of the family. I want to be able to question witnesses at the Inquest, but am worried that I will be too upset to do so? An Inquest into the death of a loved one is inevitably going to be a distressing experience, by its very nature. Attempting to do this on their own, particularly if any other party to the Inquest including those who may have contributed or caused the death by negligent acts (or as a result of something they didn’t do) will themselves, be represented by a solicitor or barrister. Our strong advice would be to obtain legal representation. Any Inquest is upsetting enough for relatives of the deceased without the added upset of the Inquest concluding without the relative raising what might be quite pertinent questions of witnesses, simply because they became too upset to do so. At Healys we have experienced coroner’s Inquest solicitors who have represented many properly interested persons at Inquest hearings. We’ll always take your full instructions to make sure that we ask the questions that you want to be asked, as well as raising questions, with your agreement, that through experience we know should be asked and which you might not have thought of? Importantly we will be able to relieve you of the stress of representing yourself in what is likely to seem like an alien and quite intimidating environment. If you would like to be represented by one of our specialist Inquest solicitors, call Jonathan Austen-Jones on 01273 685888 for a no obligation chat to find out how he or his team of solicitors can help you. If you decide you would like to instruct us, then Jonathan will be able to go through the various funding options that are available to you. It is the coroner’s job to investigate the cause of death. Coroners are appointed by the Crown. They are entirely independent. They must have been experienced lawyers – barristers or solicitors, with at least five years’ experience in the profession as qualified lawyers. A number of coroners have medical qualifications as well as being legally qualified. Senior coroners are responsible for a geographical area of the country. When a coroner has been informed that there is a body lying within their jurisdiction, they will make enquiries to establish the cause of death. In a vast majority of cases it will simply be a case of consulting with the doctor who last treated the person before they died. Alternatively, a post mortem (an examination of the dead body to determine the cause of death) may be needed to find out the cause of death. If the post mortem isn’t able to clarify what the cause of death was, or if it was an unnatural cause of death then the coroner has to open an Inquest into the person’s death. How long after death will the Inquest be held? As soon as possible but normally within 6 months. If more time is needed, the coroner will keep interested persons informed. It should be noted that a death cannot be registered until after the Inquest has been completed. However, the coroner is able to provide an interim certificate. This will allow the deceased’s family to hold a funeral and apply for probate. Although the room in which an Inquest is a court room, it is important to understand from the outset that the Inquest will be inquisitorial and not adversarial. This means that the hearing is of a fact-finding nature and the coroner is the person who will ‘take the lead.’ Because it is not an adversarial hearing, it is not like a trial where there are contested opponents. During the course of the hearing, the coroner will be quick to disallow any form of questioning by witnesses or their legal representatives that is of an adversarial nature. Some evidence will be in the form of read witness statements from witnesses who the coroner has already decided do not need to attend the hearing. Other evidence will be presented to the court by witnesses who are present. It will be the coroner who asks questions of the witnesses first. The interested persons or their legal representatives will then have the opportunity to put their questions to the witnesses. Again, it is important to note that once the witness has given their answers to a question, it is not permissible to suggest that they may be mistaken or to otherwise question the answer that they have provided. However, an experienced Inquest Law solicitor representing a PIP, may well be able to ask questions that have not been already put forward by the coroner and that bring out evidence that has not already been covered and which may be of relevance. Once all the evidence has been heard, if there is a jury then the coroner will provide a summing up of the evidence that they have heard and make any legal directions to the jury which may apply. The PIPs or their legal representatives will have the opportunity to present legal arguments as to what Conclusion they believe the jury should reach. As in a criminal trial involving a jury, the coroner will then ask them to retire to consider their Conclusion. Once they have come to a decision, the jury will be called back into court to deliver their Conclusion which will be read out to the court. If the Inquest is without a jury, then the coroner will themself hear submissions from the PIPs or their lawyers in the same manner. The coroner will then consider and reach their Conclusion. What is Regulation 28 evidence? Regulation 28 of the Coroners (Investigations) Regulations 2013 gives the coroner powers to take action to prevent future deaths in circumstances similar to those in the Inquest currently being undertaken. The coroner will do this where they deem it appropriate after taking submissions from witnesses who raise concerns after hearing the evidence at an Inquest, to the effect that there is a risk of further deaths in similar circumstances. The coroner has the power to publish a report on any such issues that have arisen and is duty bound to prepare such a report where they remain concerned that despite evidence given by the witnesses, similar incidents could occur. Instances where a Regulation 28 report may be prepared and published often, but not solely, relate to deaths in health care establishments, such as hospitals or care homes. There is no definitive list of the conclusions that can be made at the end of an Inquest. 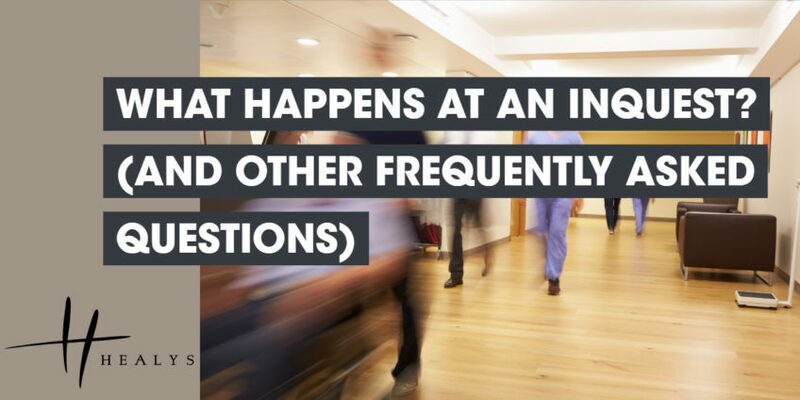 This article has set out to answer some of the questions that we at Healys are frequently asked about the Inquest process. We have attempted to provide answers in as simple terms as possible. However, Inquest Law is complex. This article only scratches the surface of what a lay person who is faced with the prospect of having to become involved in the coronial Inquest process is likely to come up against. At a time when you are probably still in grief or angry or both, having an experienced Inquest law solicitor on your side, will be a massive source of reassurance and comfort. Instructing one of Healys’ experts in the field of Inquest Law, will ensure that you are represented all the way through the process and give you one less thing to worry about. Call Jonathan Austen-Jones on 01273 685888 for initial, confidential and without obligation advice if you find yourself in the position of needing representation at an Inquest.